We believe remembering, supporting and thanking those who have given so much should not be restricted to one day per year, and certainly not limited to 2 minutes. So, on this page of our archive we intend to exhibit hundreds of images of those who wish to show their support of all our Heroes in all the services past and present - all year round. 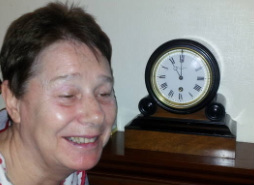 We would invite you to 'Take Time' and take a picture of yourself or someone else, with your or their Watch (or Clock) with the Time set to Eleven O' Clock. You could then 'Tweet' the picture, let us know, and we could upload it to this site. Or, you could email it to us or pin it on Pinterest. In this way we hope to record and thank as many of you as possible, who have been kind enough to contribute to and support this archive - and of course it is an opportunity for all of us to remember and commemorate all those who have given and sacrificed so much over the centuries. 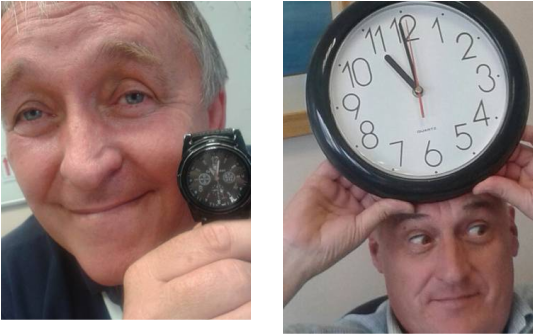 Please send us your pictures of you with your timepieces set to Eleven O' Clock to any of the contact addresses contained within the Contacts page. We promise we will include your images as soon as possible. We very much look forward to you 'Taking Time' to Remember Our Heroes! 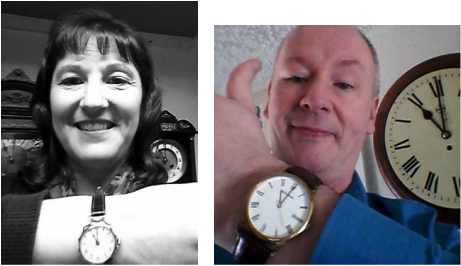 ​Cathy McAnespie (and hubby Steve) 'Taking Time' to Remember and Honour all our Armed Forces Heroes both past and present, by taking a 'selfie' and setting their Watches (and Clocks) to Eleven o' Clock. According to Cathy and Steve; 'We should remember and commemorate all year round, not just in November'. The Northern Ireland, Royal British Legion Women's Section very kindly let us include this beautiful picture. Time was taken to remember on Remembrance Sunday at Lurgan war memorial, Northern Ireland, 2015. The Royal British Legion Women's Section is a membership organisation for women which provides care and support to the Servicing and ex-Service Community. The Section is involved with many magnificent causes. Richard Edgar and Clive Higginson have written and compiled a book, 'Not Forgotten: Lurgan and the Great War'. The Book launch will be at Brownlow House, Lurgan, on Saturday, 25th June 2016. ​Guard of Honour at the Remembrance Day Parade, Lurgan, Northern Ireland. ​Kind courtesy of The Northern Ireland, Royal British Legion Women's Section. As long as we have heroes like Carole (left) Teena, Ron (behind right)...and many apologies to our fourth hero, who we did not get the name of for now. They were out in Exeter, Devon on 6 August, 2016 spreading the word about The Royal British Legion and looking for volunteers for this superb cause. Jo lives a 1930s/1940s lifestyle 24 hours a day, 7 days a week! 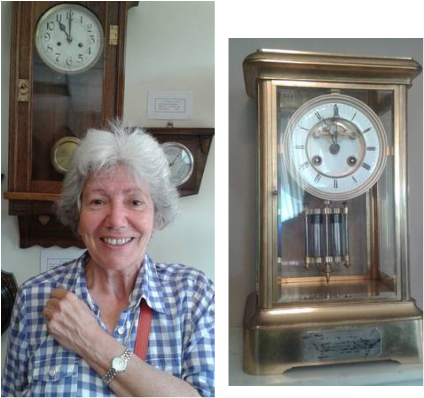 ​Jo informs us that the clock is from The 'Amsterdam School', a style of architecture that arose from 1910 to circa 1930 in the Netherlands. The Amsterdam School movement is part of international Expressionist architecture. The clock has the iconic Art Deco lines. ​Jo regularly contributes to the media, and has been involved with several film and TV productions. ​Thanks so much for Taking Time To Remember Our Heroes Jo. A snapshot of the military career of James Henry Pewsey, kindly provided by his very proud daughter Helen. ​These emotive pictures kindly provided by Helen @Hells4Heroes show a snapshot of her Father's military career with the iconic Coldstream Guards. Sadly, Helen lost her Father when she was only 9 years old. 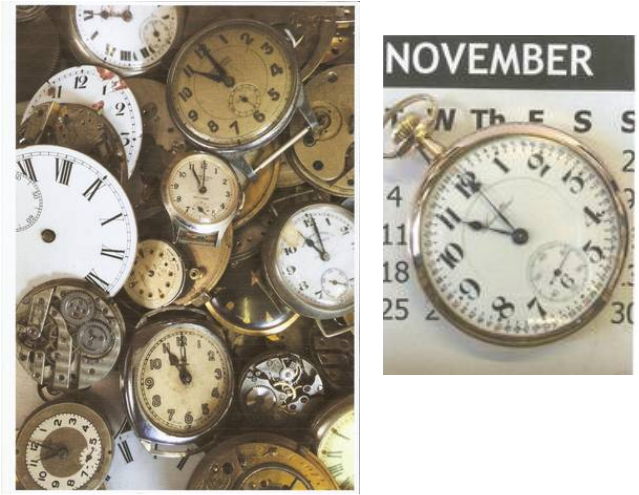 Helen wished to include her Father's memory, and legacy, within this archive, including this timepiece set to the eleventh hour. We are only too happy and honoured to take time to remember Hero James Henry Pewsey. W T F... (WHISKY TANGO FOXTROT) It's Rebecca Crookshank! The wonderful actress Rebecca Crookshank 'Taking Time' to Remember our Heroes. Rebecca kindly took time out of her attendance at the Royal Albert Hall Remembrance commemorations on Saturday evening 7th November 2015, to send this lovely image to us, with her watch set to the eleventh hour. Rebecca has personal and family links to the armed forces. Please visit the Home page for more information. Rebecca has been starring in her fabulous stage play Whisky Tango Foxtrot which begins touring the country again in Spring 2016, and has been nominated for ​4 Broadway Awards. 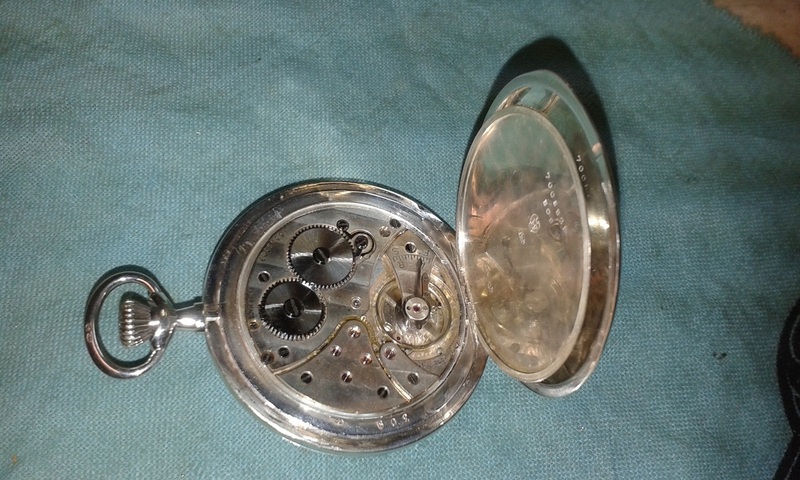 ​Silver 'Half Hunter' Pocket Watch belonging to Private George James of 1619 1st battalion London Regiment (Royal Fusiliers) who fell on 15 September 1916. Private James is remembered in perpetuity at the Thiepval War Memorial to the missing of the Somme in France. 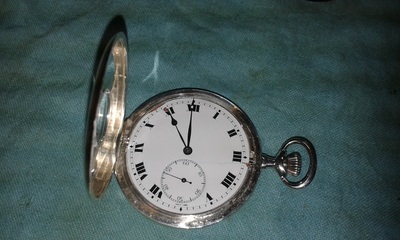 ​2 further images of Private James' pocket watch showing the movement, and the subsidiary seconds hand. Due to the damage and distortion to the case, we were unable to make a replacement bezel. 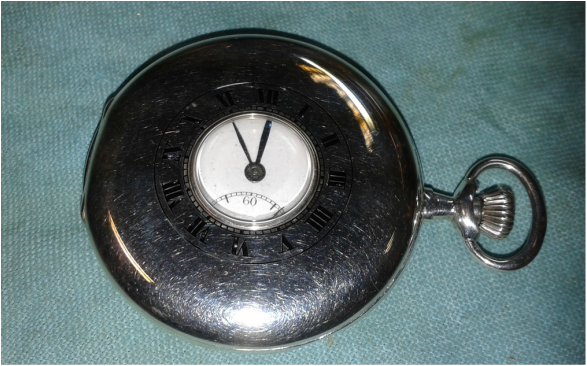 As a consequence, we were unable to fit the full hunter glass to protect the enamel dial. However, we are pleased to say that after more than a century the watch is running and keeping very good time! We will be updating this entry, and a comprehensive entry into the Home page, with much more detail and information - including a picture of Private James - as soon as we are able. He has kindly set the watch to the eleventh hour for us. 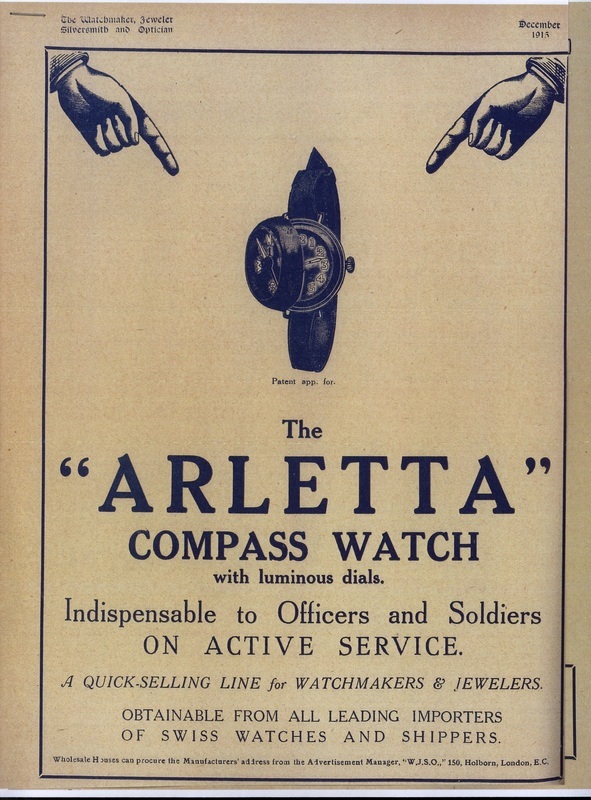 Note the original advertisement from 1915 which Adam owns regarding 'The Arletta' below. This site will be updated regularly with much more of Adam's unique collection over the next few days. This image of a sundial at the eleventh hour was taken by@LaingHome (Andy Laing) at RAF Tuddenham in the village of Tuddenham St. Mary in Suffolk. Placed on the village green it remembers the crews of 90 Squadron RAF. Kind thanks to Marcella @LadyOfShalottMA for bringing this image to our attention. Bomber Command No.90 Squadron No. 90 Squadron Motto: "Celer" ("Swift"). Badge: A hind salient. The Hind - "representative of vigilance and great speed" - commemorates the fact that, at one time, the squadron was equipped with Hind aircraft. Authority: King George VI, July 1938. No. 90 Squadron, RFC, was formed at Shawbury, Shropshire, on 8th October 1917. It was eventually equipped with Sopwith Dolphin single-seat fighters for use in France, but was not sent overseas, and on 3rd August 1918, was disbanded. Eleven days later it was re-formed as a Home Defence unit. It was equipped with Sopwith Camels and Avro 504s and remained in existence until June 1919, when it became a casualty of post-war disarmament. The squadron was re-formed as a bomber unit in March 1937, and equipped with Hawker Hinds. It was given Bristol Blenheim Mk. Is during the summer of 1937 and was selected to conduct Service development trials of these aircraft and also staged many flying demonstrations. In the spring of 1939 the "short-nosed" Blenheim Is were replaced by "long-nosed" Mk. IV's. Soon after the outbreak of war No. 90 ceased to be a first-line unit and assumed the role of a Group pool squadron or, in other words, became a training squadron. In April 1940, it was absorbed into. No.17 OTU but in May 1941, it re-formed, having been selected as the RAF squadron to receive the first Boeing B-17 Flying Fortress aircraft from America. Its role was now high-altitude day bombing and it flew its first operational mission with Fortresses on 8th July 1941, when Wilhelmshaven was attacked from 30,000 feet. It continued to operate its Fortresses over Europe - albeit with little success - until September 1941, and, later, had a detachment operating in the Middle East. Disbanded in February 1942, and re-formed in November 1942, as a heavy-bomber squadron equipped with Stirlings, and subsequently made a significant contribution to the Battle of the Ruhr, the devastation of Hamburg and the famous raid on Peenemunde. It also did a great deal of minelaying. In May/June 1944, No. 90 exchanged its Stirlings for Lancasters and with these continued to playa prominent part in Bomber Command's offensive until late April 1945. Between 8/9th January 1943 (when it began operations with Stirlings) and 22nd April 1945, members of No. 90 Squadron earned 6 DSOs 123 DFCs, one bar to a DFC, 1 CGM, 1 AFC and 33 DFMs. Cathy met Steve Keane from the Royal British Legion doing his bit and Taking Time to Remember and support our brave heroes. Cathy met up with him in Exeter, Devon, England. Steve is noted for all his great work for the Legion, not least the South West Coastal Path Walk he undertook in 2013 in aid of the Legion. We blink and then it's gone. So who then is the master? This outstanding display can be found at Elizabeth Court care home, in Burnham on Sea in Somerset. The image on the left shows just a very small part of the overall remembrance display. It was created by the residents, staff and families, who were very keen for us to exhibit their inspiring work in our archive in order to remember all loved ones who bravely gave their lives during both World Wars. This marvellous picture can be found at Elizabeth Court. It sits proudly next to the iconic poem 'The Soldier' by Rupert Brooke. Mrs Judy Clarke (who painted the emotive picture left) was on hand to provide some expert painting tutorials. Please see below for more beautiful creations. The picture looks as though it was specifically meant to capture the mood of the poem. Regrettably, this unique display is not open generally to the public but only to family and friends of the residents. We felt it more than deserved an entry into our archive though. These creative examples are from Anne, Mary, Victoria and Margaret from Elizabeth Court. Many thanks to Phil Sutcliffe who has sent us this image of the Omega watch his parents gave him for his 21st birthday. 'My father, Charles Samuel Sutcliffe, but always known as Sam, was born in 1898, grew up scrimpingly poor in Edmonton, north London, and volunteered with the Royal Fusiliers in September, 1914, mainly because he wanted to be with his older brother, Ted (christened Philip and I was named after him 25 years after his death from wartime poison gas damage in 1922). Sam trained for a good while, in Tunbridge, Malta and Egypt - he never again travelled abroad after WW1, not uncommon for his generation of working-class people. He entered battle when he jumped down from a lighter on to the beach at Gallipoli in September, 1915. A Signaller in the front line, he got through the fighting, terrible weather, awful food and dysentery until the January evacuation and recuperated back in Egypt for a while until his Battalion – 200 remained out of a thousand – was sent to France. Transferred to another Regiment, on the Western Front he fought through the Somme campaign (he was in the trenches on July 1, the first day, when 57,000 British soldiers were killed and wounded) until discovery that he was only 18, and even then still under-age for fighting abroad. From late 1916 until late 1917 he shuffled from London to Harrogate to Cramlington to Clipstone to Crowborough and so on, "training" one way or another. Then they sent him back to the Western Front where, near Arras, amid the German Spring Offensive he was taken prisoner and spent several months in southern Germany, near the Black Forest, until the Armistice and the German Forces' collapse saw him walking west towards the Front, where several welcoming souls nearly killed him with kindness - you don't give a steak dinner to a starving man - but eventually sent him home. His Memoir, written in his '70s, without diaries or any kind of notes, is extraordinary: he had a near-total recall of events, but also of places, their sounds and smells, and of his own feelings which he doesn't hold back, although in ordinary life he shared the reserve you might expect from a man of his generation'. You can read more about Phil's father in the book; Nobody Of Any Importance: A Foot Soldier's Memoir Of World War I by Sam Sutcliffe, edited by Phil Sutcliffe, philsutcliffe47@gmail.com - all author/editor royalties/'earnings" to the Red Cross. Taking Time to Remember for Remembrance Day 2014. The Army Cadet Force and other important helpers, doing a grand job supporting our Heroes by collecting for the Poppy appeal. An inventive way of Taking Time and remembering our Heroes. This beautiful image of a sundial at eleven with a poppy placed near the gnomon has been sent in by John from Warwickshire. This is Angie and Peter from Exeter, Devon. They run their own company, 'Only in the Wild'. They were at the 'Crikey It's Vintage' day out at Killerton House, Devon, on 22 June 2014, and were only too delighted to show their support and 'Take Time' for our Heroes. Angie and Peter do a lot of fabulous work for the excellent charity, 'Help For Heroes' and are always raising money for this brilliant cause. Jefferson Davis' (Confederate President of the CSA) Pocket Watch. Kindly set to eleven to honour our Heroes all over the world, by Mr & Mrs Berry, Medford, Oregon, USA. Please also see the entries regarding President Davis, and many other images of his watch on the Home page. This outstanding inclusion to the archive shows a commemorative inscribed watch case dedicated to A R Windus 1916. This image formed part of the excellent site watchuseek.com's tribute blog forum for the commencement of WW1. 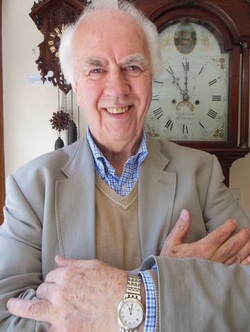 Regrettably, the contributor who tooktime to remember, is not known but if anyone visiting this page can throw some light onto the ownership of the watch we would be obliged. 'Bonzo' The Dog from the 1920s TakingTime with his Very Special Watch, Wanting to Show his Support for all the WW1 and WW2 Heroes and not to Forget Everyone still Serving All over the World. Many thanks go to Pocket Ted From WW1, who wanted to join Bonzo in giving his thanks and showing his support for all those brave Heroes who have sacrificed so much over the centuries. If you want to find out more about Pocket Ted go to @Pocket_Ted on Twitter. He is standing on a beautiful French Ormolu Sevres mantel clock, which he kindly set to eleven to remember our Heroes! Helen, little Eliza, and Michael from Bournemouth, England, all wanting to show their support for all our Heroes everywhere! Hoe, Spade & Snowy, all the way from Minnesota in the USA. They wanted to salute our Heroes by Taking Time to show their watch at eleven. 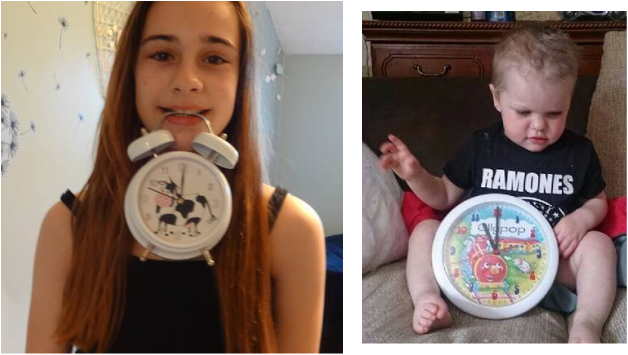 Thing is, they havent yet learnt how to set the watch, so their Mom is going to do that for them and they will send another picture once they have. This unusual clock was found in Coledale, in Sydney Australia by the wonderful singer/songwriter Guy Walton. He sent it in to timeforremembrance.com to support and remember our Heroes everywhere. Alan, from Exeter, Devon England getting into the spirit and TakingTime to Remember. The lovely Scotney children, James (on the left) and Edward, from Nottingham, England got in touch, and wanted to show their support for our brave Heroes in the services and Armed Forces all over the world! 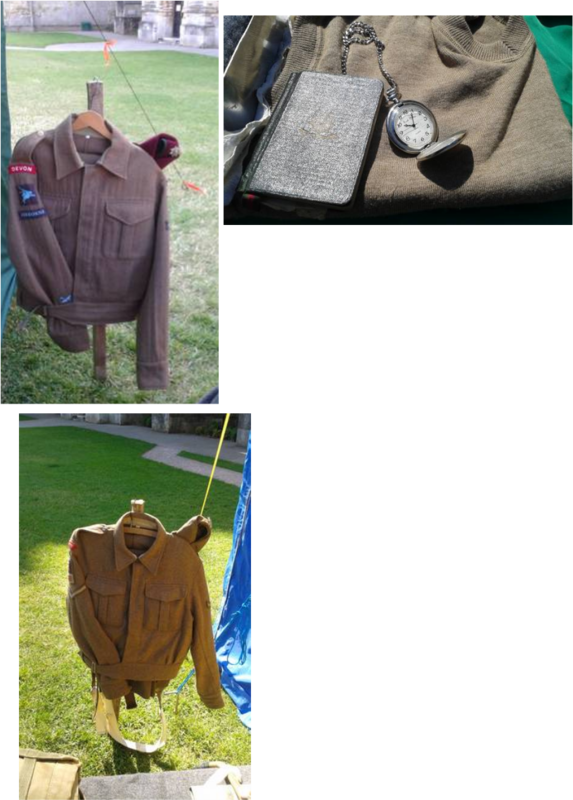 With great thanks to the 2nd Devon's Living History Group at 2nddevons.com for Taking Time to contribute these wonderful images of a WW2 12th Airborne Devon Battallion dress and replica pocket watch along with diary. These images were taken from the 2nd Devon's Living History Group display stand in Exeter Cathedral during Exeter's Armed Forces Day on 21 June 2014. Tunic of the 2nd Battallion Devonshire Regiment WW2. By very kind courtesy of 2nd Devon's Living History Group who always take time to remember. Zak the labrador (on the left) from North Cadbury, England, couldn't resist contacting us to show his support, TakingTime from his owner to do so! 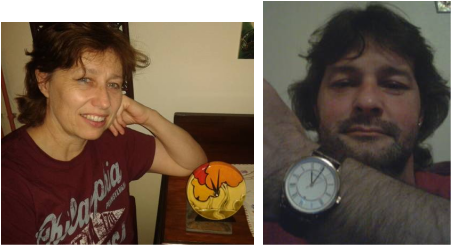 'Piggy' from Portishead, Bristol, England here, keen to display his support for our Heroes by setting his clock to eleven! Big thanks to Rebecca from Portishead, Bristol England for sending in this 'alarming' way of Taking Time to remember and support all our armed forces and services past and present. Olly on the right here, wanted to say 'Thank you' to all our Heroes - and all those that fought to make his world a better place. Many thanks to Terry from Kings Nympton, North Devon for Taking Time to honour our Heroes. In this image he is setting 2 longcase clocks to Eleven. 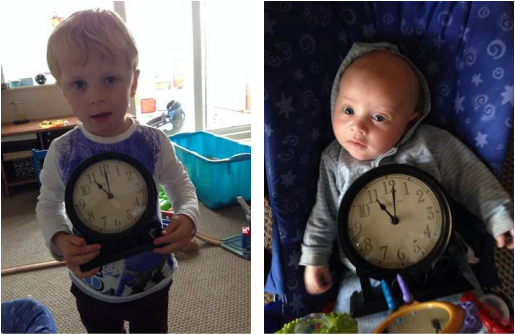 The one on the right being a single-handed clock with just an hour hand. There is no minute ring on the outer edge of the chapter ring, and only quarter of an hour divisions on the inner edge of the chapter ring. This would indicate the clock dates to an age when accurate time recording was not such an issue. Grateful thanks indeed to Christine from Exeter, Devon, for being happy to show her support for our Heroes in all the services worldwide. On the right, courtesy of Killerton House, Exeter, Devon, a 19th century French, four - sided glass, striking mantel clock, set to 11 o' clock. Killerton House in Exeter is the historic ancestral home of the Acland family. Peter (on the left) from Merriot in Somerset, England, kindly taking time to remember our Heroes in this 70th anniversary year of D Day - June 6 1944. On the right here, Ian from Yeovil, Somerset. Also wanting to show his respect for our heroes past and present, in his own more light-hearted way. These fabulous ideas to commemorate our Heroes - by setting multi watch parts to Eleven - were sent in by John, a watchmaker from Warwickshire. It must have Taken some Time to achieve!. 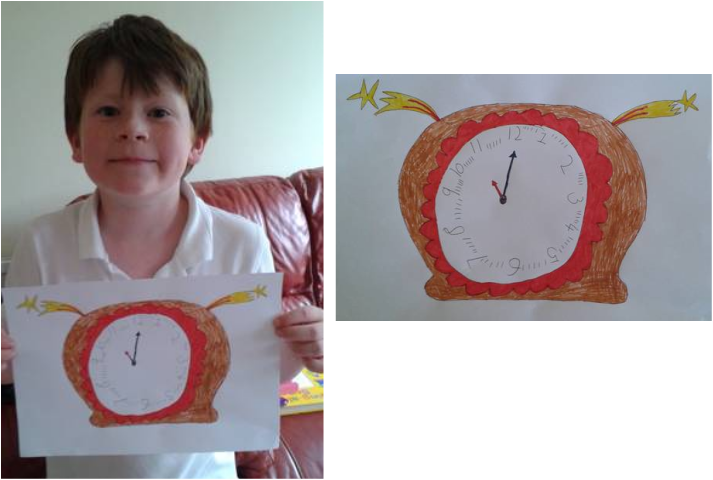 This is George from Willand, Devon, who wanted to remember and honour his Great Granddad (who was also called George) and all our other heroes, by Taking Time to draw this excellent picture of a Clock set to Eleven. The clock even has its minute divisions. Huge thanks to the Alleyway Antiques Centre in Bridport, Dorset bridportantiques.co.uk for Taking Time to remember our Heroes. 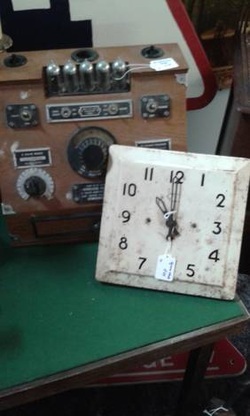 The clock set to eleven sits next to a great replica 'Spirit of St Louis' radio.